We are into the 33rd matchday of the Premier league and today we have Tottenham hosting Bournemouth for the match at White Hart Lane. Tottenham are still trying their best to compete for the title as they currently have 68 points from 31 games, seven points below Chelsea and five points above Liverpool. On the other hand, we have Bournemouth who have 35 points from 32 games, one point below West Ham United and one point above Crystal Palace. Tottenham finished second last season and from the looks of the current situation, they would be again be finishing at the same position. They have 68 points from 20 wins, eight draws and three losses, scoring 64 goals and conceding 22 goals in total. Harry Kane has been their consistent performer in terms of goals with 19 in this season so far and Bamidele Alli also has 16 goals as well. Wanyama would be returning against Bournemouth after he was forced to withdraw against Watford. Winks and Lamela would remain on the sidelines. Kane is expected to start. Tottenham have won all five of their last five games in the league. Bournemouth have 35 points from nine wins, eight draws and 15 losses, scoring 45 goals and conceding 57 goals. Joshua King has 13 goals to his name so far and has been their most consistent player so far. Bournemouth have lost two and drew in their three meetings with Tottenham so far, conceding eight goals and scoring only once. In their last five games so far in the league, they have two games, drew two and lost one. They played against the table toppers Chelsea and lost the game by 1-3. 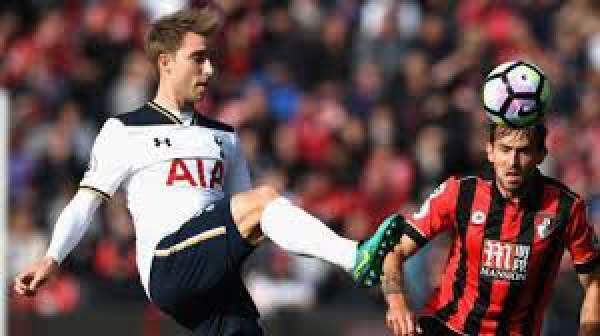 Tottenham would be very difficult to play at home and they are quite stronger as compared to Bournemouth.